A little while ago I wrote a post about being prepared when you go on hikes, and I follow my own advice from that post for every hike I go on. Recently I learned the important lesson that being prepared for hikes is also highly dependent on the season. Generally, I avoid snowy roads in the winter because I know I am not the best driver in it. For that reason, I never thought to keep winter travel necessities in my car. I was never going to drive down a snowy road so why would I need it right? WRONG. You always think it can’t happen to you until it happens to you. I started driving down a road with a little bit of snow on it thinking my AWD Subaru could handle it, and that if my car couldn’t handle it I would be able to turn around. Well, a little bit of snow quickly turned into two feet of snow on an impossibly narrow road to turn around on. When my car got stuck my first feeling was pure embarrassment because I know better! I know I am not the most capable winter driver, I know I don’t have the necessary tools to get myself out. I shouldn’t have gotten myself into this situation and yet I did. Thankfully some other people made the same mistake I did and we were all able to work together to dig ourselves out before the situation became dangerous. That terrible moment you realize your car is stuck and you don't have anything to fix that situation. In hopes that others can avoid making the same dumb mistake I did, I wanted to provide a winter guide to prepare you for your winter hikes. Check the road conditions and trail conditions multiple times. In my first post, I linked to WTA to check the conditions of the trail you are planning on hiking. WTA can also be a great place to check the road conditions before you go. In Winter the weather changes often, and with it the road and trail conditions. The road I was stuck on was marked as completely clear four days earlier on WTA. Obviously, that wasn't the case anymore and it was covered by a couple of feet of snow by the time I drove down it. I could have prepared better by calling the local ranger station and asking them for the road conditions or checking in multiple places online to see if the conditions had changed since the last WTA trip report. Check the weather, and prepare for the worst possible forecast. When I checked the weather on Mountain Forecast it appeared that snow wasn’t forecasted for the elevation I was going to be hiking at. At some point that forecast changed and I missed it. I knew that day wasn’t going to have the best weather so I probably should have checked more than once, and definitely the morning I left to make sure conditions were still as expected! Make sure you have the right gear and apparel. Microspikes and a warm jacket are essential for winter hiking! Summer in the mountains tends to be more forgiving when it comes to not having the best gear. You might be uncomfortable, but you are less likely to die due to wearing sneakers over waterproof hiking boots. Winter isn’t the same. If you plan on being in the mountains for an extended period of time, make sure you are prepared with at least waterproof boots, wool socks, microspikes, moisture wicking base layers, waterproof gloves, a waterproof jacket, and a warm puffy or another insulating jacket. I would also add waterproof pants or gaiters, a warm hat, and trekking poles if you are able. Also, check to see if the snow is deep enough to require snowshoes before you hike otherwise you won't get very far! It might seem okay to venture out without some of these things, but remember, if you get lost or need to spend the night, having appropriate clothing on could make all the difference in keeping you alive in freezing wet conditions. I understand that cost is always an issue for some, but you can find these items heavily discounted at REI Garage sales, or thrift stores. I have also snagged some items from Buy Nothing Facebook groups! Have the 10 essentials for your backpack AND winter travel essentials for your car. If only I had more than blankets and an air mattress in my trunk. What I don’t hear as often is what to have in your car in case you get stuck in the snow on your adventures. The information is out there but I don’t think it’s pushed towards the average winter hiker as much as it should be! So what should you have in your car if you plan to travel in the mountains in winter? Here are some basics to get you started. A Winter Survival Kit: flashlight, batteries, blankets, snacks, water, and a first-aid kit. You can find pre-assembled ones online, or you can put one together yourself. These items are important to have in case you get stuck and need to spend time in your car waiting for help. If you want to read more about how to prepare for winter driving Take Winter By Storm has a great checklist to get you fully prepared to tackle winter roads! Before hiking in winter snow always check the avalanche forecast. If marked considerable or above be real honest with yourself on your level of knowledge and experience with traveling on avalanche terrain. If you are reading this blog post I am assuming you don't have much, so it's best to avoid avalanche terrain altogether and find a hike with no snow, or one with very low avalanche risk. 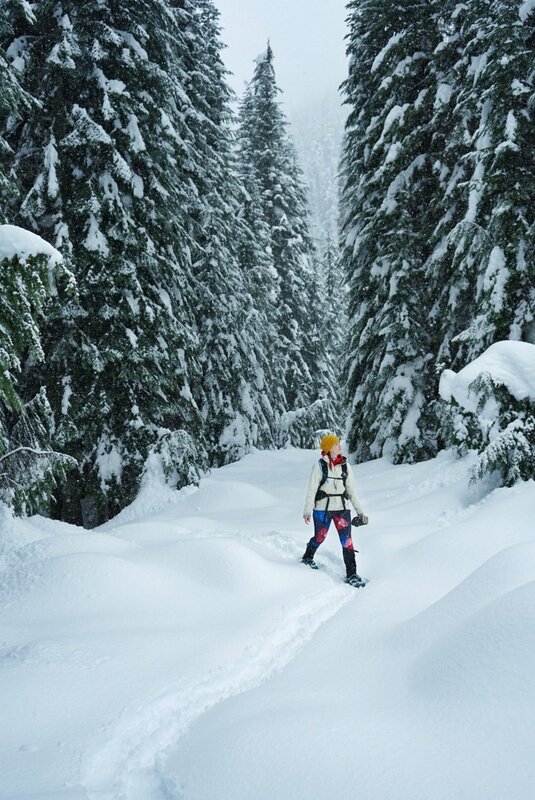 Flat road walks can be a great option when the avalanche forecast is high! Be prepared to turn around or stay home. Are there any ways you prepare for winter adventures I don’t have listed here? I would love to hear about it in the comments!